The BBRSDA has been working hard to create visually compelling assets to provide to our direct-marketers, and we’re proud to show you what has been done so far. 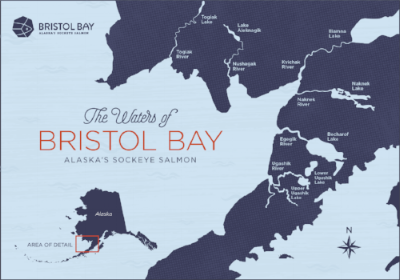 Here’s a few resources available to Bristol Bay fishermen who direct-market their catch. - Direct Marketer Order Form: Direct Marketers can now order materials (free of charge) directly through our bristolbaysockeye.org website. We have recipe cards, ice signs, and box stickers available. - Video Assets: During the 2017 fishing season we produced several short promotional videos about fishing in Bristol Bay. The videos are available for download from the media library or on our YouTube channel - Bristol Bay Sockeye Salmon. - Bristol Bay Sockeye Suppliers Page: We maintain a directory of Bristol Bay Sockeye suppliers at bristolbaysockeye.org/suppliers. Email info@bbrsda.com to be added to this directory. Each year the BBRSDA contracts with the McDowell Group to prepare this comprehensive overview of the forces impacting our fishery and sockeye markets worldwide. 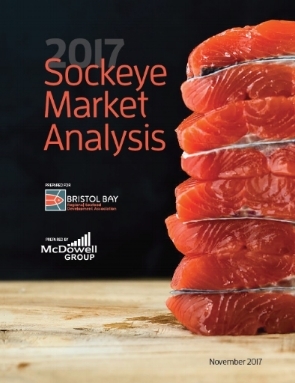 The Fall 2017 Sockeye Market Analysis is now available for our members to download. Fishermen may also be interested in a PowerPoint presentation that Andy Wink, of the McDowell Group, presented at our November 2017 membership meeting during the Pacific Marine Expo. The PDF captures key findings from the larger report in easy-to-read tables and charts, along with other important commentary.